All of our meals are freshly prepared on a daily basis. It is our aim to ensure that all students can choose from a wide range of healthy, tasty and nutritious meals and products. If a student has a special diet or any food allergies we would appreciate if you could inform the school. A ‘grab and go’ provision for students who do sports and other activities on a lunchtime. A pre-order system which means less queuing at lunchtime. Students can pre-order their lunch at breakfast or morning break and it will be ready for collection at lunchtime. Vending machines located in the main school to purchase a variety of food and drinks throughout the day and for after-school activities. We offer a breakfast service for all year groups in the Sixth Form café, situated in the main school building. A selection of breakfast items including cereal, bacon/sausage sandwiches, toast and croissants are available as a breakfast meal deal or individually priced. During breaktime a wide range of food and drink is available including the breakfast items mentioned above, sandwiches and wraps, fresh fruit and yogurt, and a selection of juices and flavoured water. Hot drinks are available from the vending machines. Our menu is produced in line with the Government’s new food standards. For those students who bring a packed lunch to school we ask parents to refrain from including confectionery, crisps or fizzy drinks. If a student has a food allergy or a special dietary request, please inform the school, specifying the type of allergen/dietary request. Should you require any further information please contact the Catering Manager on 01434 610308. The school operates a biometric cashless school meals system. The biometric system is based on fingertip recognition technology. Every student is issued with an account which allows them to buy food and drink at morning break and lunchtime using their fingertip or pin number. Money can be added to the account by online payments via the School Gateway app/website, which also provides information on school meal balances and purchases. Alternatively, payments can be made by cheque or cash. 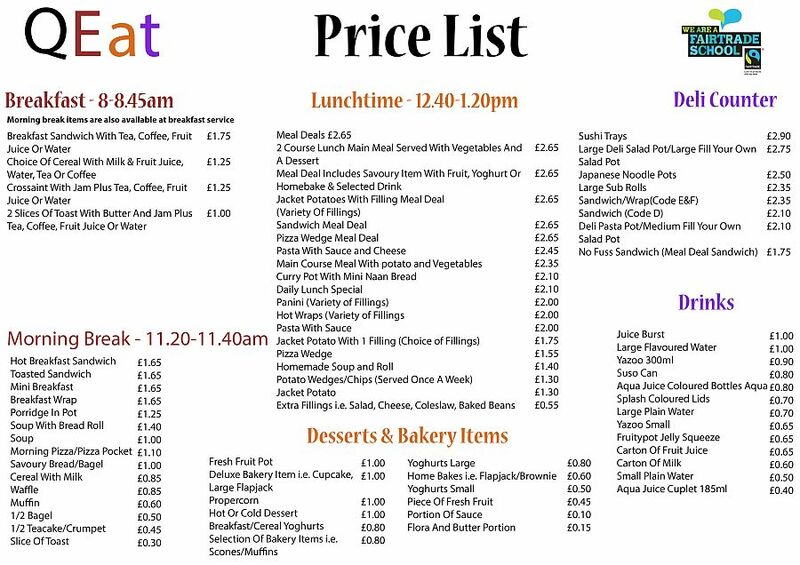 A daily spend limit can be applied to a student’s account; if you would like further information on this please contact our Catering Manager via Reception. To set up online payments, you will need to visit the School Gateway website and click on ‘New User’, entering the email address and mobile number that the school holds on record for you. If you have changed your email or mobile phone number please contact the Pastoral Office and they will update your records to enable you to log in to School Gateway. You’ll receive a text message with a PIN number. Use the PIN to log into School Gateway and complete the initial setup for payments using your bank account number and sort code. After this is set up, payments can be made on either the website or the app (see below). The payment is set up as a direct debit. Direct debits are used so that School Gateway can instruct your bank to make payments, but this is only ever done when you make a request on the School Gateway website/app. Unlike other direct debits, this is not a regular monthly payment – you are in control of how much is taken and when it is taken, and are able to cancel the arrangement at any time. To make a payment click on the Payment Box, and click ‘Add School Meals’. There is a minimum payment for school meals of £13.25, equivalent to a week’s worth of meal deals, but there is no maximum payment. Once you have paid online and the payment has been processed, you will receive a confirmation email. Payment will be received through School Gateway to your child’s school meals account the day you make the payment, however, your bank account may not have the money taken out of it for a few days. Download the app: If you have a smartphone, please download School Gateway from your app store (Android and iPhone). You will be able to check the balance, top up the account and see that the money has been added to your child’s school meals account under ‘My Lunch Money’. Cheques should be made payable to Queen Elizabeth High School or QEHS. Please write your child’s name on the back of the cheque. Cheques should be placed in an envelope and clearly marked with your child’s name, form class and amount. Cheque deposit boxes are located in the main foyer by the kitchen door and the Hydro foyer. Cash may be added to your child’s account by using one of the cash loading machines situated in the Lower School or Hydro building. It would be appreciated if students’ accounts maintain a credit balance at all times. Students can check their account balance on the cash loading machines located in the school or they may ask at the till point. We will however endeavour to notify students if their balance is low or the account has insufficient funds. Contact will be made with parents/carers where insufficient funds are available or there is money owing on the students’ account. Students leaving school will only be issued a refund if the balance is over £5.00. Please request a refund form from Reception and this will be processed through the Finance Office. If your child qualifies for free school meals the monetary value of £2.65 is added to the account daily and they have total anonymity with the system. If students wish to purchase additional items above the free school meal allowance money can be added to their account by the School Gateway app, cheque or cash. We know from our records that a number of parents do not claim for their entitlement of a Free School Meal for their son/daughter. Free school meals entitlement enables your child to have a free hot or cold lunch every day and the school will also receive additional funding to spend on extra support for your child. This additional funding continues to apply for several years after a student ceases to be eligible for free meals, so it’s still worth applying even if you think you will qualify for only a short period of time. The eligibility criteria for free school meals have been changed this year, and the Government estimates that around 50,000 more pupils will benefit from a free school meal compared to the previous system. This letter explains the changes and how they might affect you. Benefit details for applications can usually be checked on receipt. However, if confirmation cannot be found, you will be contacted to provide proof of benefit. The information you provide will be used to check if you are in receipt of a qualifying benefit and, if you are on Universal Credit, that your earnings do not exceed the threshold. If you claim Universal Credit, your earnings will be assessed from up to three of your last Universal Credit assessment periods. If you are eligible, your school will be notified. Your child will receive free school meals and the school will receive extra funding. We appreciate that some parents do not claim free school meals as they feel that they can manage without, but the school will receive vital funding even if meals are not taken, and your child will be entitled to other types of support. With the cashless catering system we use, students can be assured of total anonymity. Their catering account is topped up automatically every day to the value of a ‘meal deal’, and this may be spent on meals or individual items. Please note that students cannot ‘save up’ their allowance from one day to the next. Money may be added to their account should you wish to purchase additional items above the free school meal allocation. Most people won’t be affected by the new criteria. If you’re currently claiming free school meals, but don’t meet the new criteria, your child will continue to receive free school meals until the end of the Universal Credit rollout period. This will apply even if your earnings rise above the new threshold or if you stop being entitled to Universal Credit. The rollout period is currently scheduled to end in March 2022. If you need any further information, please speak to a member of school staff or the local authority. You can also visit the free school meal website. If you would like any further information regarding our school lunches, please see our website or contact the school office. If you think you might be eligible, please make a claim as soon as possible and use your entitlement – don’t let your school miss out on this important extra funding that will benefit your child. Certain data will be held on the system to enable accurate operation. This will include the student’s name, registration group, photo, account balance and meal entitlement. This data is handled under the guidelines of the General Data Protection Regulation (GDPR) and only used by parties directly involved with the implementation of the system.